This bottle is from what we used to refer to as the Li Junting school and have now determined to be a late-nineteenth-century school probably located in Yangzhou (see Moss and Sargent 2011). Our clue to this attribution is supplied by the style of the mask handles. Mask-and-ring handles were a regular, if not common, feature of the school and are remarkably consistent when found on the better carvings. The regularly curly pates of the standard courtly mask are simplified and formalized. What were eyebrows on the original have now become long, sweeping lines ending in the first curl on each side, high above the eyes. The rest of the hair is defined by two further curls only, terminating at the apex of the long forehead. In this case, some formalized hair appears, carved on the upper curls, but this is unusual. This distinctive arrangement of curls seems to appear exclusively on wares of the school, as illustrated by Sale 2, lot 73. The elongated ring handles are a further feature typical of the school, although these represent a general rather than a local trend in the mid-Qing period. The significant point lies in the fact that whenever mask handles are found on these Yangzhou bottles, the rings are almost invariably elongated, sometimes exaggeratedly so. We know that the court ordered hardstone bottles carved at Yangzhou during the mid-Qing period. The records reveal that in 1806 the Jiaqing emperor ordered ten snuff bottles in hardstone made at Yangzhou (Xia Gengqi 1995, p. 30). While this seems likely to have been one of the eight imperial hardstone-carving facilities maintained by the court after the massive influx of raw material from Xinjiang after 1759, it was, in any case, active for the court in 1806. If imperial hardstone carving were produced there, the skills would also have existed to carve glass, either around 1806 or later in the century, when Li Weizhi and Li Yunting were having overlay bottles made (see Moss and Sargent 2011). This colour appears sufficiently often from the Yangzhou school, as an overlay and occasionally as a ground colour, to be accepted as part of the standard range (see, for instance, Sale 1, lot 119 [note that the discussion of Li Yunting there has been superseded by Moss and Sargent 2011], Sale 5, lot 59, and Treasury 5, nos. 1039 and 1044). 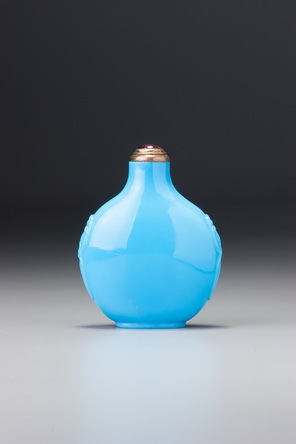 Any glassworks capable of producing overlay bottles could as easily produce plain ones, and almost certainly did. There was a large market for both categories, and no commercial workshop in China would have ignored this potential source of additional business. An example of an equally rare carved monochrome glass bottle attributable to the same school is provided by Sale 4, lot 96. This bottle is most likely blown, possibly into a mould, as the tell-tale concentric rings surrounding the mouth indicate; its relatively light weight also is commensurate with it being blown. The carving and polishing are exemplary, and the form is both impressive and an illustration of total technical confidence.